Here at college, I can tell you that most of the people I’ve met have changed their major at least once before actually settling on one. And I’m not talking about some simple switch like from being a doctor to a nurse—I’m talking totally differing areas of study. Social welfare to creative writing, for instance. Now, some of you might have had an idea of what your major would be from way back when, so the idea of a switch might seem kind of scary. But let me ask you, what seems scarier: spending your life in a profession you end up hating, or actually taking classes you enjoy that will lead to a glorious, smile-abundant life and career? Well, then, that could be a problem, I’ll admit. Firstly, though, I’ll tell you this little secret: a strong percentage of people don’t finish college in four years. Some go four years and a semester. Some go six. Sure, it’s more costly, but hey—you’re on a scholarship website, remember? Seriously, though. You do what you have to do. And there are ways to alleviate this problem. When you sign up for classes your first few semesters, make sure to throw in some “fun” classes too. At most schools, you’ll have required classes, like math or English, and then you’ll probably want to dive right into your intended major. But I’ll advise you to throw in some other classes as well. Some that aren’t related to your major—some that you think you might be interested in. Just a little bit of interest is all you need. This way you might discover some other area of study that you’re interested in sooner rather than later. Take the classes that have fun names and descriptions—take the classes that your friends aren’t taking. In fact, when I signed up for classes my freshman year, the advisor told me to sign up for whatever. He told me it didn’t matter what my major was—just take classes to explore different studies. His theory was to have people sign up for classes they were interested in, and then look at what majors those courses lead them to. That’s one tactic. I can tell you now that every college class you take will help you in some way, even if it is just strengthening your critical-reasoning skills or something. And if you’re unsure of your major? Well, you are in an interesting position. And let me tell you: don’t rush to land a decision! You might feel a lot of pressure to choose your area of study, and that’s no fun. Don’t decide on a major just to get those nosy people off your back—make up your major if you have to! 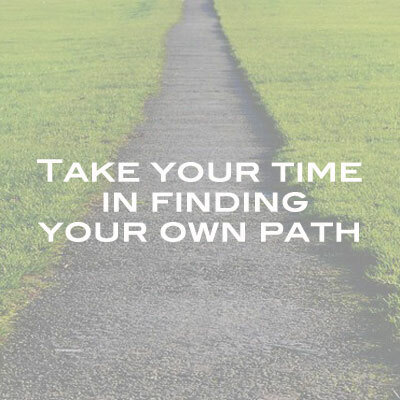 Take your time in finding your own path. And if you stick to your interests and really take the classes you want to take, you’ll find your major, I swear. Switching majors—or taking a while to find one—is no big deal. I won’t tell you to expect a switch; just be ready to accept it if you do change your mind. Because who knows? You could be sitting in your college classes and realize it’s not at all what you had in mind for your major/future career. And that is A-Okay. College is supposed to be all about the learning process, right? Savanna Buehlman-Barbeau is a student at the University of Wisconsin—Madison, where she is pursuing a major in anthropology with a certificate in archaeology. She has survived AP exams, the ACT, college applications—and most important, her first year of college.